Halfway through the Monster Energy NASCAR Cup Series season, 69% through the regular season, Kyle Larson and Martin Truex Jr. are offset by one point. The lead, currently held by Ganassi Racing’s Larson, may change in the eight races remaining before the postseason begins at Chicagoland Speedway. 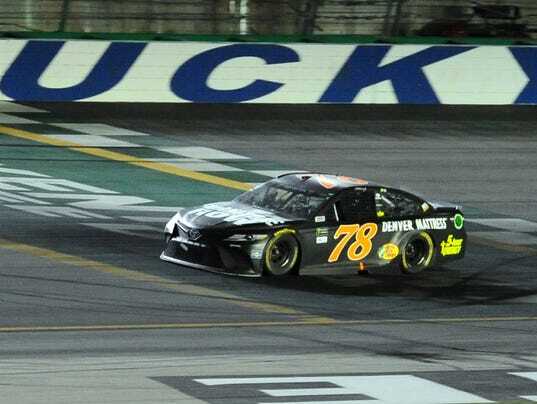 It would have on Saturday night at Kentucky Speedway had Larson not made 90 green flag passes to rally through the field twice to finish second as Truex Jr. romped to a third win of the season. Numbers will continue to define this intriguing contest for the emerging title contender that is Larson and the driver trying to exploit the prime of his career and career opportunity that is Truex Jr.
28: the playoff point total Truex Jr. has already amassed for use throughout the first three rounds of the playoffs. Larson has 13. 100: The gulf between Truex Jr. and third-place and winless Kyle Busch. 15: The bonus points the regular season champion will be awarded, with the second-place driver, almost certainly Truex Jr. or Larson, receiving ten.